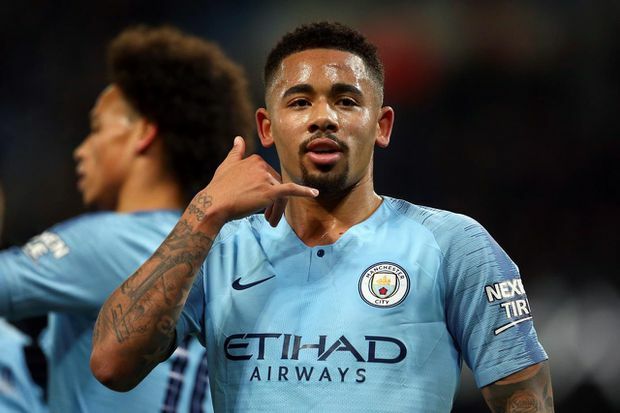 Manchester City forward Gabriel Jesus gestures after scoring a goal during the English League Cup semi-final first leg match against Burton Albion, at the Etihad Stadium, in Manchester, England, on Jan. 9, 2019. Gabriel Jesus scored four as defending champions Manchester City destroyed third-tier Burton Albion 9-0 in their League Cup semi-final first leg, a record margin of victory in the competition’s last four. League One Burton, managed by Nigel Clough, the son of former Nottingham Forest boss Brian Clough, must endure another 90 minutes at their own ground on Jan. 23 before City formally books its place in the final. Hundreds of Burton fans arrived late after their buses were stuck in motorway delays and, after this mauling, they might well wish they had turned around and gone home. City, which beat Championship (second tier) side Rotherham United 7-0 on Sunday, is set to face the winner of the other semi-final between Chelsea and Tottenham Hotspur, which Spurs lead 1-0 from the first-leg. Manager Pep Guardiola fielded a strong starting lineup and City quickly established its dominance with Kevin De Bruyne steering in a header from an excellent lofted ball from David Silva to open the scoring in the fifth minute. Burton should have drawn level in the 12th minute but Marcus Myers-Harness wasted a glorious chance, shooting wide when left unmarked at the back post. From then on it was a painful night of attempted damage control for the team from the Midlands. Jesus opened his account on the half hour, heading in from close range after Leroy Sané’s shot had been blocked by keeper Bradley Collins, with the ball popping up invitingly for the Brazilian. Four minutes later, Jesus made it 3-0 with a low drive that went in off the post. Then Ukrainian Oleksandr Zinchenko added the fourth with a lofted shot from nearly 30 metres out. Jesus completed his hat-trick in the 57th minute with a header from a Riyad Mahrez cross before substitute Phil Foden made it 6-0 in the 62nd – slotting home after Collins had blocked a Jesus shot. The seventh – and Jesus’s fourth – was a clever flick from close-range after Sané had once again burst into the area on the left flank. Burton was completely unable to defend that part of the field and even with Sané subbed off, Mahrez broke into that area and his low cross was turned in by Kyle Walker to make it 8-0. City’s biggest ever margin of victory was a 12–0 FA Cup win over Liverpool Stanley in 1890. The Blues beat Huddersfield Town 10-1 in the old Division Two in 1987.